Choosing beautiful yet unique wedding decorations is a top priority for brides in the midst of wedding planning. To capture the romance and emotion of your upcoming marriage, there is nothing better than personalized décor. Whether you’re inspired by minimalism or want a more luxurious feel for your reception, The Wedding Shop by Shutterfly has everything you need to give your big day a custom touch. When your big day finally arrives, have the preparations in place to make it special with custom-tailored stationery that’s as stylish as your décor. Chic, personalized cards from The Wedding Shop infuse your ceremony and reception with instant elegance. Choose from a variety of styles and designs to create a coordinating set of wedding day stationery. Customize your wedding programs to help your guests enjoy the ceremony, and enhance your reception décor with beautiful menus and matching place cards. You can even customize stylish gift tags and stickers to add a personal touch to your wedding favors and napkins. Your guests will delight in the sophisticated charm you’ve included in every detail of your wedding’s décor, from your first steps down the aisle to the evening’s last dance. It’s your wedding day, and it should be decorated your way. From table settings to centerpieces, infuse your personal style into your reception with personalized décor from The Wedding Shop. Choose from custom candles, plates, jars and more to etch your personality into every aspect of your big day. Personalized flower pots and glass vases make your floral arrangements even more beautiful, while custom glass plates and coasters dress up your reception tables. Whether your taste is elegant or more whimsical, simple or ornate, The Wedding Shop features a curated collection of reception décor that suits your unique style. Your one-of-a-kind wedding décor isn’t complete without some of your favorite photos. Showcase those beautiful shots of the happy couple with custom photo décor that celebrates you, including guestbooks, art prints and more. A personalized photo guest book is a unique way to share the story of your lives together. Give your guests a sweet, reminiscent look at the pictures that capture how you met and how you fell in love, as they leave notes of congratulations and advice for a happy marriage. 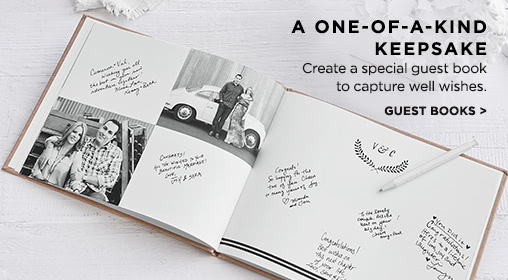 Your custom-designed wedding guest book is a stunning piece of décor for your big day, and a keepsake you’ll cherish for the rest of your lives. Weave a thread of personalized style throughout your entire ceremony and reception with other photo décor that highlights the strength of your love. Canvas prints and art prints lend a classic look, while wood wall art is perfect for a rustic wedding. Decorate your reception tables with fun, personalized acrylic blocks or romantic glass prints that coordinate with your wedding theme and colors. Toast the bride and groom in style with The Wedding Shop’s personalized reception drinkware. Beautifully etched with your names, wedding date and more, our glassware instantly brings a custom touch to your table settings. Choose from classic champagne flutes, modern stemless wine glasses or rustic mason jars to bring your wedding day inspiration to life in every detail.